A REPORT by Stormont civil servants listing more than 20 ways in which Brexit could hit Northern Ireland's economy was produced a year before the referendum on leaving the European Union. The document obtained by The Detail under Freedom of Information legislation was compiled in May 2015 by the European Policy and Co-ordination Unit in the Office of First Minister and deputy First Minister (OFMdFM) which is run jointly by the DUP and Sinn Féin. Their office has refused to answer questions over whether the analysis was ever publicised, but the 15-page report does not appear to have featured in the referendum campaign. The OFMdFM paper listed a series of ways in which a UK decision to leave the European Union (EU) could damage Northern Ireland’s economy, impact on its business and trade, reduce Foreign Direct Investment, hit employment, and create political difficulties. In a further development, two of Stormont's opposition parties have claimed the 2015 document was not discussed with them, even though they were members of the government at the time. Alliance Party former minister Stephen Farry also said the report could have influenced the public debate given its "clear analysis of the risks and consequences of Brexit from those charged with providing objective and impartial advice". Sinn Féin campaigned to remain in the EU. The DUP called for a UK exit and continues to support that position. 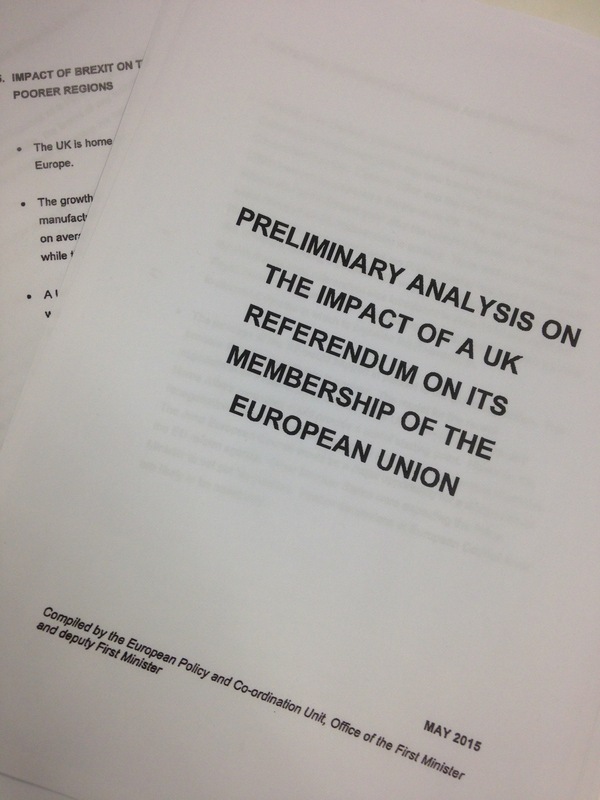 The OFMdFM document of May 2015, produced far in advance of this year's June 23 referendum, is entitled "Preliminary analysis on the impact of a UK referendum on its membership of the European Union". It cited the likely scenarios for the UK’s future relationship with the EU. The document said that Brexit risked widening the gap between richer and poorer areas of the UK, highlighting the particular risk to Northern Ireland. The 15-page analysis, available here, devoted three pages to listing "Potential areas of conflict for Northern Ireland in the event of Brexit". It began by recognising that the impact of a UK exit would depend on the terms of any withdrawal. "Although the UK is a net contributor to the EU, NI is a net beneficiary, so the immediate financial impact to NI is likely to be negative." "Should the UK withdraw from the EU, and subject to the terms of withdrawal, we could lose access to: €862million in Structural Funds and European Social Fund over the period 2014-20; €2.5bn in Common Agricultural Policy funding (2014-2020); and loss of access to competitive EU funding which in the period 2011/12 - 2013/14 had amounted to £72.7million." The analysis examined the possible impact on the economy, including a drop in GDP "estimated at approximately 3%", while also noting that “lack of subsidies would put NI farmers and related industries at a severe disadvantage to their RoI counterparts." "NI as a location for Foreign Direct Investment (FDI) might be less attractive to companies who want to do business within the EU." "As a location for FDI to access EU markets, RoI might emerge as a more favourable location for developing economies. Harmonisation of corporation tax with RoI could be undermined with accompanying budgetary and transactions costs rising significantly." "Loss of FDI could impact on demand for domestic production, with a knock on reduction in training requirements, a decline in skills levels and demand for tradeable and non-tradeable services." The report considered the impact of changes to employment law after leaving the EU and added: "If NI had lower employment rights standards in comparison to RoI there could be potential impacts for the NI economy including with regards to FDI projects." Examining the impact on airports, the OFMdFM analysis said: "Regulations concerning transatlantic air traffic are negotiated at EU level, which could be detrimental to NI’s international connectivity." The document said that changes to the border could burden businesses with additional costs: "A full external EU land border with RoI would impact on the flow of people; capital; animals; and goods and services. It is likely to come with an associated significant administrative cost, especially since RoI is NI’s second largest trading partner after GB." On wider costs to the public purse, it added: "There are likely to be very significant legal implications, which will require a significant workload to disentangle and restructure the NI statute book...The legal and administrative resource required to do this would be significant." The civil servants highlighted the potential risks to cross-border infrastructure projects, cross-border trade, as well as risks for cross-border healthcare provision. Elsewhere the report raised issues around the existing all-island energy market. WAS THE DOCUMENT EVER DISCUSSED? The Alliance Party’s Stephen Farry was Stormont’s Employment and Learning Minister when the report was produced within OFMdFM, but he does not believe it was ever discussed with him. "This seems to be purely a civil service process which unfortunately didn’t lead to a political level discussion at the Executive at that time," said Mr Farry, whose party supported the campaign to remain in the EU. "Perhaps, it could have made some difference in terms of what some people were arguing before the referendum. "But even from what was a limited civil service process, it is sobering to note the clear analysis of the risks and consequences of Brexit from those charged with providing objective and impartial advice." An Ulster Unionist spokesperson, representing the party's former Regional Development Minister Danny Kennedy, said: "We have no recollection of this being formally circulated at the Executive." The SDLP failed to comment. The impact report was released under Freedom of Information legislation to an applicant who filed a request in February 2016 and who received the document on June 24, the day after the referendum. The Detail later received the document as part of our own separate FoI request. After the UK voted to leave the EU, the First Minister Arlene Foster and deputy First Minister Martin McGuinness agreed a joint letter which raised areas of concern with Prime Minister Theresa May. Their letter, available here, included many of the issues flagged-up in the OFMdFM analysis written ahead of the referendum.